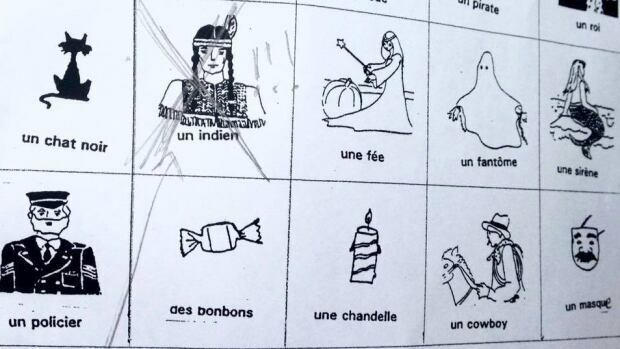 Teacher at École Notre-Dame-De-Grâce removed image after being contacted by parentsAn NDG dad is raising questions about an elementary school assignment that made reference to an "Indian" man. Eric Robillard says each week his daughter, who attends École Notre-Dame-De-Grâce, is given a vocabulary sheet with the goal of matching a word with an image. For Halloween, the sheet featured a fairy, a ghost and a mermaid—along with a man in a native headdress. "We didn't think it was a costume," Robillard told CBC Montreal's Daybreak on Tuesday. Comment: Which one of these Halloween things is different from the others? Hmm, that's a toughie. Halloween school assignment in Quebec: Identify the fairy, ghost, mermaid, Indian, and other make-believe items. For more on Halloween, see British Model Dresses as Dead Chief and Ellie Goulding in a Headdress.